Awwyas! It's finally here! Thank you for your patience and enthusiasm. 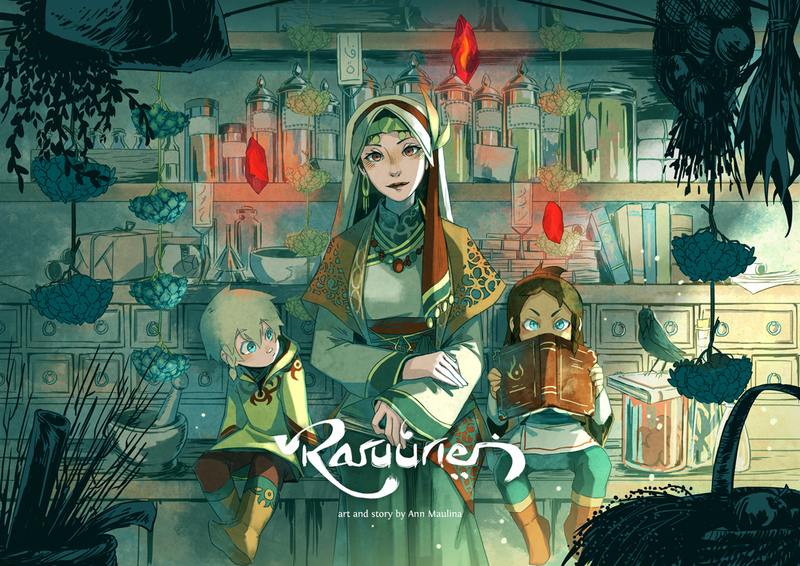 They brings Raruurien from indie-publishing to here--a webcomic series! New readers! Welcome! and nice to meet you. My name is Ann. Here I bring Raruurien, a heart warming myth-infused tale about an ostracized herbalist raising her children. Raruurien was indie-published as one of three comics in Kroma Comic Anthology in 2015 and then was republished by local comic publisher in July 2016. The book won Pakoban Award (2016) as the Best Compilation and TGR Award (2016) as the Best Local Comic. In early 2017, Raruurien also independently won Bronze Award in 10th Japan's International Manga Awards. Phew, that was quite a journey, but I'm looking forward to have another journey here with you for years to come! This webcomic is brought to you with the help of Hiveworks. The pages will be updated twice a week (Monday/Thursday) To subscribe for comic updates, you can follow my twitter or like Raruurien's facebook page.